Stay in the loop! 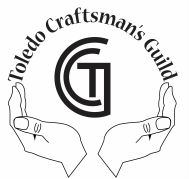 Sign up for our email list and receive updates on our upcoming shows prior to each of The Toledo Craftsman's Guild's shows (March, April, November, and December). Occasionally, an additional email will be sent, but we promise not to overwhelm your email inbox. And we will never, ever sell your email. We don't like it when our email address is sold and our inbox fills with spam, and we're sure you don't like it either.